Home / STORE / Wedding & Anniversary Nisse. 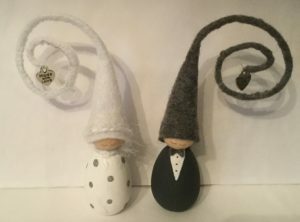 / Wedding Nisse. on their own or as the start of a collection of Anniversary Nisse. They are very popular as Wedding Cake toppers as well. The Bride & Groom are sold as a pair. and the Bride all in white with silver sparkles on her dress and feathery sparkles on her hat and scarf. They both have hats that spiral round ending with a heart charm with the words ‘made with love’ engraved upon it.